Sleep problems are common, with one in three adults reporting issues with that all important shut eye. Though we can survive without sleep for long periods, day-to-day activities can become difficult, without rest. Often, we only notice how important sleep is when we must endure long periods without it. 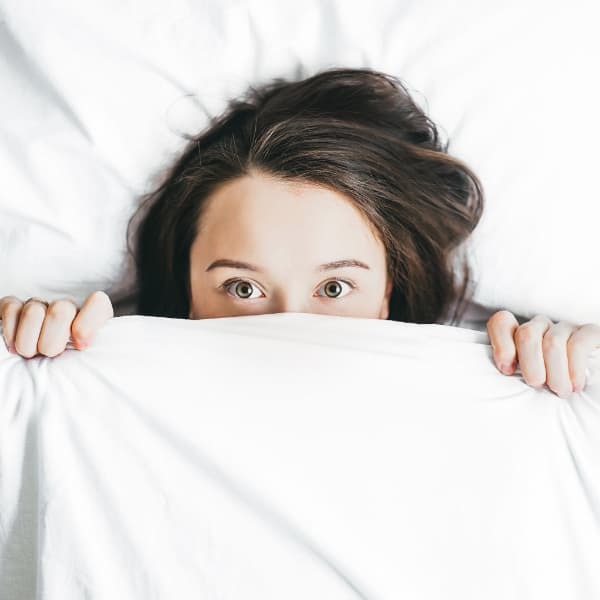 While our sleeping patterns can be thrown off balance during stressful periods, such as moving house or completing a significant project at work, not all issues with sleep can be considered a ‘sleep problem.’ A sleep problem can only be diagnosed if an individual persistently experiences difficulty sleeping over an extended period of time. If you find yourself questioning 'Why Can’t I Sleep Even Though I’m Tired?' then read on as help is at hand. What could be behind my inability to fall asleep? Despite the commonly repeated advice that we should all aim for eight hours of sleep per night, there is no real set rule for sleep as long as we wake up rested and refresh. However, we must acknowledge a sleep problem if our lack of sleep begins to affect daily life. Most issues with sleep are caused by environmental factors found elsewhere in our lives. If we become overly anxious or worried, our bodies produce large amounts of the cortisol hormone which causes us to struggle to relax and switch off. • A new sleep environment that you have yet to adjust to. • Changes to your daily schedule, such as jet leg or night shifts at work. • Faults in your sleep environment, including high levels of noise or light. • Substance abuse, such as overconsumption of drugs and alcohol. • Excessive consumption of caffeine. • Side effects of medication. • Mental health conditions, such as post-traumatic stress disorder (PTSD) or schizophrenia. • Health issues, such as chronic pain or bladder problems. Sleep problems may also arise due to physical factors. Some may occur due to genetic or biological makeup, affecting an individual’s brain. They may also be related to an underlying health condition that you are unaware of, such as hormone imbalance or a bad reaction to newly prescribed medication. Consult your General Practitioner if you believe your sleep problem is related to a physical concern. How can I treat my symptoms? Psychotherapy and counselling can be useful tools for treating sleep problems. Speaking with a professional counsellor or therapist can help individuals identify the potential root causes of their sleep problems, including lifestyle choices or issues with stress. They may also provide information about relaxation and mindfulness techniques that can be used before bed to help unwind the body and mind. Cognitive Behavioural Therapy (CBT) may be particularly helpful for individuals whose experiences of anxiety affect their sleeping patterns. While some individuals are prescribed sleeping pills to help with their sleep problem, the use of medication is not a preferred solution for most GPs in the UK and their long-term prescription is actively discouraged. Your GP may wish to talk you through a routine of improved ‘sleep hygiene.’ This involves identifying practical changes that you can apply to your lifestyle to help improve your sleep. • Creating a healthy sleeping environment, such as keeping your bedroom dark and cool. • Reducing time spent using electronics before bed, or removing electronics from your bedroom altogether. • Following a regular sleep schedule across weekdays and weekends. • Reducing your intake of caffeine, alcohol, drugs, or nicotine. • Discussing healthy sleeping arrangements and routines with your partner. Some GPs may refer you to a sleep clinic if symptoms of your sleep problem do not improve. Sleep clinics can provide further treatment from specialists to help you see improvements.